The latest iteration of the iconic TLT boot from Dynafit has new plastic, liners, power straps, and colors. Switching to Pebax from Grilamid stiffens the lower shell and allows for more stretching if you need an advanced boot fit. The new Custom Light (CL) liners are thinner and lighter than the previous TLT6, which is great for moving fast. New Ultra Lock power straps have a pull-adjustment, quickly eliminating any extra space between your shin and cuff before skiing. Afterwards, one pull on the cord releases it for skinning another lap. Finally, the Italian painters switched to a cool black with orange-y highlights. The result is a yet-more-refined version of the boot that set the standard for lightweight performance. UltraLock 2.0 system is still one of the fastest and surest ski/walk mode mechanisms. Carbon fiber upper cuff provides impressive lateral stiffness with a responsive flex. Stiffer Pebax lower shell increases the power transfer from the carbon cuff to the ski. 60° of ankle articulation set the bar that others backcountry boots still hope to reach. Claw sole is rockered and rugged, designed to let you move safely and freely on rock. Driving Spoiler 2.0 is a structural bridge between upper & lower cuffs that keeps out snow. Magnesium toothed buckle catches and fine-tunable latches that adapt to your foot shape. Booster tongues (67g) are removable so you can customize your uphill and downhill experience. Custom Light liner (158g) with flex zones allows for freedom of movement with less weight. Patented QuickStep inserts are the gold standard for ease of entry and release. Extra insulating layer of felt and aluminum shields your feet from the cold snow below. Forward lean is easily adjustable by swapping a metal lean/lock receptor. New Ultra Lock power strap (43g) provides precise control with a quick-release. My TLT 6's are broken...... If I was generally happy with those boots, what is the preferred replacement? I've thought about the Alien RS which seems to be in a bit lighter weight class. And then TLT 7 appears to be generally unreliable... What do you reccommend? Hey Mike! The Alien RS has a lot of potential to be a great replacement actually. I don't think the TLT7 would be a good fit for you. The Movement Alp Tracks Performance is pretty much the spitting image of the TLT6 in terms of fit. The Salomon X-Alp is another good one, but is closer to the TLT5 than 6, still fairly similar though. When in doubt, here is a direct line to our boot fitting fairies. Finally a boot worth replacing my old TLT5s with, and not requiring a mortgage. These did have early ankle banging qualities, before molding especially. I have boney ankles. The issue has disappeared this season with break in. I have wide forefeet but the 5s worked fine. These are even more comfortable. As Jason and crew pointed out you can only punch boots with more carbon so much. This has become a very comfortable, highly tourable, stiff and high-performing boot. It's less fussy than the TLT5 (which I chose to strip all straps and insert cuff from over time). The 6s power strap is well worked out compared to the 5s. The removable cuff/tongue remains an annoying if (maybe) necessary evil (mostly for resorts, never manage to get in when touring, maybe don't ski well enough for it to matter). The liner is very high-end in finish and flash, we will see how well it holds out over time. They also have a kind of darth aesthetic which is hard not to like. I've been skiing on a pair of TLT 6s - the mountain version without the carbon upper and with the CR liner. Great boot, but I'm after something stiffer without the weight of the Vulcan. I take a 28.5, and had to have the boot punched for my slightly bigger left foot. I'm hearing that I should drop a size if I go to the TLT6 Performance CL. Would a 27.5 be good given what I've said, and that the boot can be adjusted even more than my last set? Hi James, thanks for the feedback. The CL liner is thinner than the CR, and the shell seems a touch wider for 2015/16. Together that makes the boot feel more roomy. That said, if you needed to modify a 28.5 CR for fit, going all the way to a 27.5 is probably pushing it. But yes, it is more pushable. If you haven't been able to fit into this boot in the past, this is your year. I fit into this boot with only the slightest punch, which is almost unheard of for me. Very comfortable. It is incredibly stiff for how light it is and has excellent no-resistance ROM (seems substantially better than my Aliens). The power strap design is also very efficient, if you aren't going to rip it off. All I could ask for is an Alien-style lever that didn't require messing with pant cuffs (or cutting holes in them), but I'll survive. 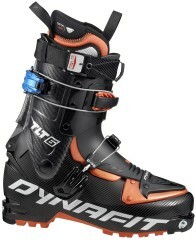 Dynafit's years of experience and refinement shine brighter than ever here. Best boot I've ever used. Hi Leka, these only go up to size 30, which is officially about a size 12.5 shoe. Odds are a skilled boot fitter could get you in that size. Check out the Sportiva line for comparable boot available in longer lengths.